Cut the tempeh in 8 squares. Whisk the marinade together and pour over tempeh. Let sit as long as you have time for. When ready to cook, pour tempeh and marinade in a pan with sides and cook covered on medium high heat. Turn the tempeh over after 5 minutes and cook on the other side. Chop up the onion and saute in olive oil and dash of salt in a pan with sides. Dice up the carrot and add to the onions. Cook for a few minutes, seasoning with salt and garlic powder. Add the rice and toss around to coat. In a 2 cup measuring cup, combine vegetable broth, water, and tomato paste. Pour over rice and bring to boil. Reduce to a simmer and cover. When the liquid is absorbed, add the peas and cook to heat through. Peel, pit and mash up the avocado. Peel and de-seed the cucumber and dice. Dice up the red onion. Chop the cilantro. Mix together. 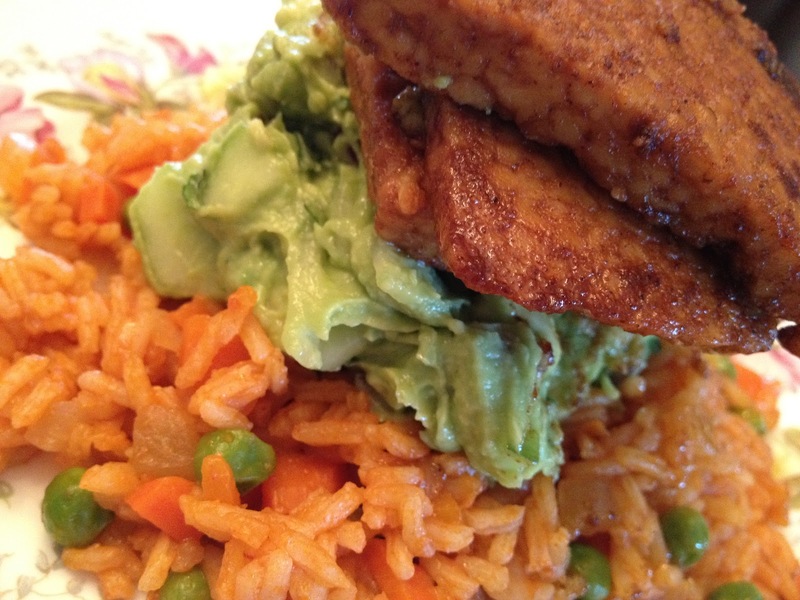 To serve, place rice on a plate, top with avocado salad and tempeh. Enjoy!